Did Trump Just Hint at Building the Border Wall Using the Military? President Donald Trump briefly threatened to veto a giant spending bill on Friday and then reluctantly signed it to keep the military funded. The lack of funding for a border wall with Mexico is likely one of the president’s biggest frustrations. Trump mentioned the wall when he threatened to veto the bill. 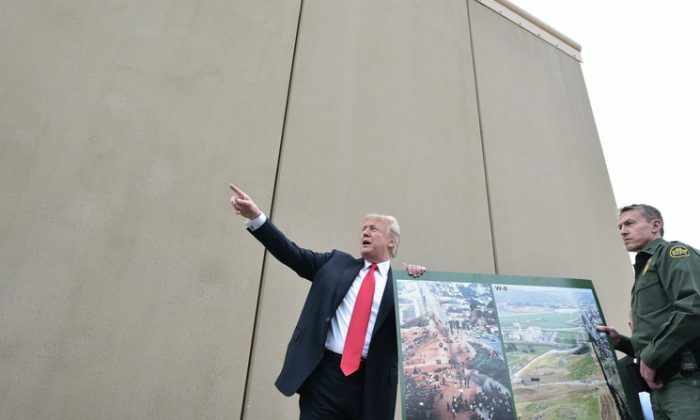 The $1.3 trillion budget includes just $1.6 billion for wall construction along the southern border, far short of the $25 billion needed to accomplish Trump’s signature campaign promise. To make matters worse, the spending bill specifically prohibits Trump from building the kind of wall he wants. The president nevertheless celebrated the progress and pointed out that construction can begin immediately. But Trump also dropped an eyebrow-raising hint that he could take an unprecedented option and build the wall using the enormous military budget. For the first time, Trump underlined the significance of the barrier as a military structure and a matter of national defense. Up to now, the president promoted the wall as a way to curtail illegal immigration and stop the deadly flood of illicit drugs. The introduction of the wall’s military function is significant, especially in terms of funding it. Roughly half of the spending bill is dedicated to the military for a total of over $654 billion allotted to the Pentagon’s base budget and overseas counterinsurgency operations. That’s enough to build the wall 26 times. Immediately after he alluded to the wall’s military function, Trump called upon Gen. James Mattis to comment on the newly secured military budget. The general’s mention of “spending every dollar wisely” stood out in particular because the military would have to secure just 3.8 percent in cost savings in order to fund the wall construction. Considering how urgently Trump wants to build the wall, it’s a surprise he didn’t float the military option earlier. As commander in chief, he has ultimate power over the military. Each branch of the armed forces has a construction division. The Army Corps of Engineers alone employs 37,000 people who specialize in building critical infrastructure. It’s hard to argue against the barrier’s military significance. Iran’s terror proxy, Hezbollah, has built up an alarming presence in South America. As Trump ramps up pressure on the Iranian regime, the threat of commandos crossing the border on suicide missions to cause mass civilian casualties is real. Meanwhile, illegal drugs flooding into the country via the Mexican border are resulting in a tragic loss of life. Fentanyl, a commonly trafficked drug, was responsible for 20,000 American deaths in 2016. America lost 4,491 troops during the entire eight years of the war in Iraq, which cost the United States up to $6 trillion. In comparison, erecting a wall that can help reduce the staggering loss of life from the drug epidemic is well worth 3.8 percent of the military budget.